Gent4Humanity Refugee Support: "What can we do?" Michelle and Oliver Wright are proof that expats can fully integrate into Gent. They demonstrate that expats can go beyond surviving here, they can thrive and contribute to the community, making it a better place than it was without them. They did just that by co-founding Gent4Humanity, a registered non-profit charity that provides humanitarian aid to refugees who are currently displaced in Europe. We spoke to them in 2018 about how it all works. Michelle is originally from London. She grew up there and recalls, “I thought everywhere in the world was like London. I thought everyone had different colors. I had a bit of a shock when I started travelling and realized that not everybody was as accepting as Londoners are.” And travel, she has. Oliver and Michelle Wright. Photo © Gent4Humanity. After living in the U.K., Michelle lived in Spain, the United States (Alaska), and Belgium. She has lived in Belgium for ten years. The first three were spent in a small village near Dendermonde where she says nothing ever happened. She and her (then) husband, now ex-husband, owned a café. While she had fun with that for a time, she was eventually driven to sell the bar and move to Gent, where she has now been for seven years. Michelle has a degree in psychotherapy. She was a social worker in London. She’s also worked as an ECG technician. While married, she was diverted from care work, but upon her divorce and move to Gent, she resumed her work in that field. First, she volunteered at an asylum center. Then she got a job at a day center/night shelter in Gent where she worked for two years. 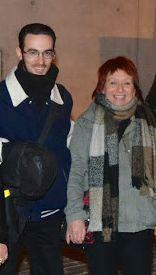 One reason Michelle chose to move to Gent is that her son, Oliver, was studying here. “I really loved the city. There’s something about Gent that just attracted us … It’s just great. It had everything we wanted.” The move was good for her, allowing her to return her focus to care work, and getting her back to a diverse, multicultural city like the London she grew up in. Oliver grew up with his mother, moving to all the same countries. But while they’ve lived in the same places, he of course, has his own perspective. Oliver was born outside of London, but he doesn’t feel like he grew up there. Their move to Spain occurred when he was seven years old. Then there were the two years in the U.S., and then the move to Belgium. When Michelle was working at the night shelter in Gent, Oliver was working in what he called a “cutthroat corporate environment.” He recalls that at the time, “I was never indifferent, but I had other priorities, I guess like a lot of people. I had my music, my hobbies, my interests, my life. I wouldn’t say I didn’t care, I just didn’t really look.” But eventually, he became dissatisfied with his work. Michelle Wright (far left) and Oliver Wright (second from right) lead a Gent4Humanity team meeting before a trip to refugee camps in France. Photo © Gent4Humanity. Oliver observed and listened to what Michelle said about her work at the night shelter. He reflects, “I always had a choice in this, and I could have gone either way in terms of getting involved, in terms of helping other people.” He made a choice to get involved and started volunteering at the shelter. Oliver eventually stopped working at the shelter and took another job in a more corporate environment, but his involvement with Gent4Humanity at that point kept him balanced. He could do that work because he invested his free time in charity work. In fact, he says he could “daydream” about it. Daydreaming together back when they were both working at the shelter is essentially how Michelle and Oliver started their refugee support work to begin with. “Saying ‘what can we do?’, that’s how it all started,” Michelle explains. They went to the camp with new socks to donate. They spoke to the refugees there at the time, mostly from Syria and Iraq. The conditions of the tent camp were shocking. Michelle remembers the smell. Soon after, Michelle saw another news report, this time on BBC, about the conditions in the Calais (France) refugee camp, with a plea for donations. Again, she found herself wondering, what she could do? “It was very impromptu,” Michelle remembers of their first trip to Calais. Conditions again were shocking. Michelle said that she knew halfway into that day that this would not be a one-off trip. She knew they’d be coming back. 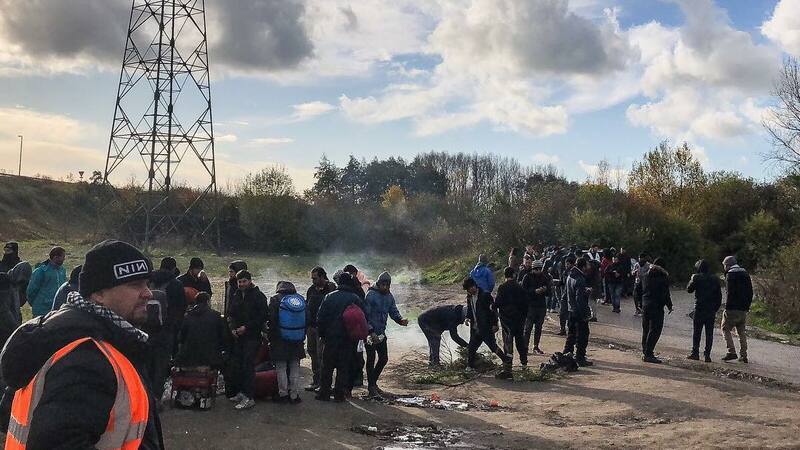 From April to October of 2016, they went to the Calais “Jungle” twice a month. (“The Jungle” is the name given to that refugee camp in Calais by the refugees themselves, a nod to the conditions they faced there.) They named themselves Gent4Humanity and started taking volunteers with them. In October 2016, the Jungle was demolished, and refugees were relocated by French authorities. Gent4Humanity started making trips to Dunkirk instead. In June 2017, Gent4Humanity received its official recognition as a non-profit charity (a Vereniging Zonder Winstoogmerk, or VZW) in Belgium. Over time, the conditions of the refugee camps in Dunkirk and Calais change. They’ve been demolished, burned down (sometimes on purpose, sometimes by accidents), and rebuilt. Through it all, Michelle says, “We kept going.” They continue to go every month, usually to both locations since refugees have returned to Calais. They have learned from their experiences and continuously adjust their operations to be more efficient and effective. 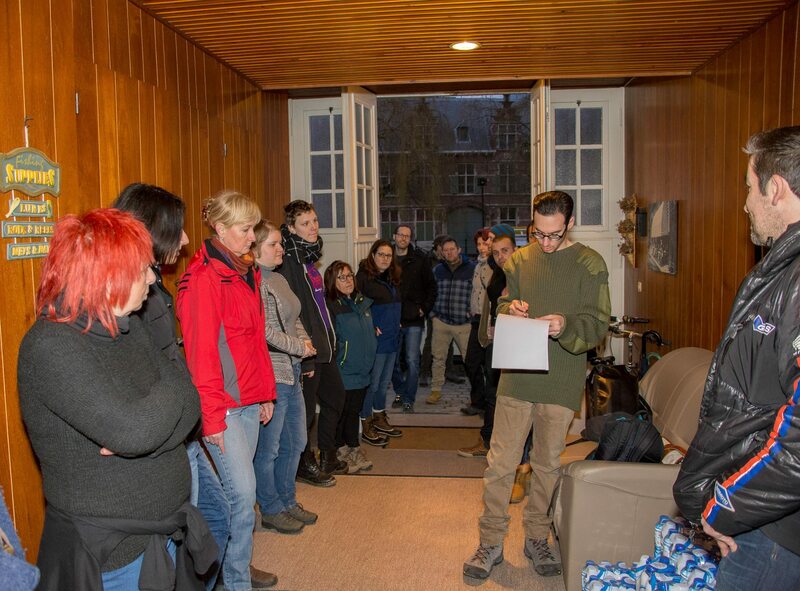 Only a handful of organizations provide humanitarian aid to the refugees in Northern France. It’s not the sort of place where any one organization is in charge, but Gent4Humanity works with other organizations as best they can. Given Gent4Humanity’s growth of their volunteer base, donations, and projects, visiting the camps once a month is what’s most logistically possible. Many charities supporting the refugees in Northern France have seen a decrease in support and donations because people think the refugee crisis there is over. But it is far from it. Refugees and volunteers at the camp in Dunkirk. Photo © Gent4Humanity. According to the UN Refugee Agency (UNHCR), the world is “…now witnessing the highest levels of displacement on record.” 65.6 million people have been forcibly displaced from their home due to conflict or persecution, 22.5 million of whom are defined as refugees. These numbers are expected to keep increasing, not only because of continued conflict and persecution, but also due to an increase in climate refugees. “This is just the beginning,” warns Oliver. Organizations estimate that before the Calais Jungle was demolished in 2016, it was home to 10,000 refugees. Estimates are that there are still hundreds of refugees in Calais and Dunkirk. Many are trying to reach the UK. The refugee crisis is a messy, complicated, global, political issue that is often discussed with as many emotions as facts. Gent4Humanity aims to stay away from the political aspects of the conversation. Oliver explains, “We are a humanitarian group, a humanitarian charity. We’re not activists.” Their purpose is to help refugees, as humans helping humans. “We believe that every human being has the right to be treated fairly and in a dignified way,” reads their website. And that is what they do, by providing direct humanitarian aid. Here’s what Gent4Humanity does. The one-day trip they make each month usually includes a visit to either or both camps in Dunkirk and Calais. Michelle and Oliver explain that every trip is different, and they never know what to expect. This can be difficult for both new and returning volunteers. Michelle said that after their first trip to Maximillian Park, she and Oliver didn’t speak to each other for hours. “We couldn’t talk. We couldn’t speak, it was too overwhelming.” Despite them both having experience working in social services, refugee support in these frontline conditions can be shocking. They are mindful of this for their volunteers and do their best to train and prepare them. 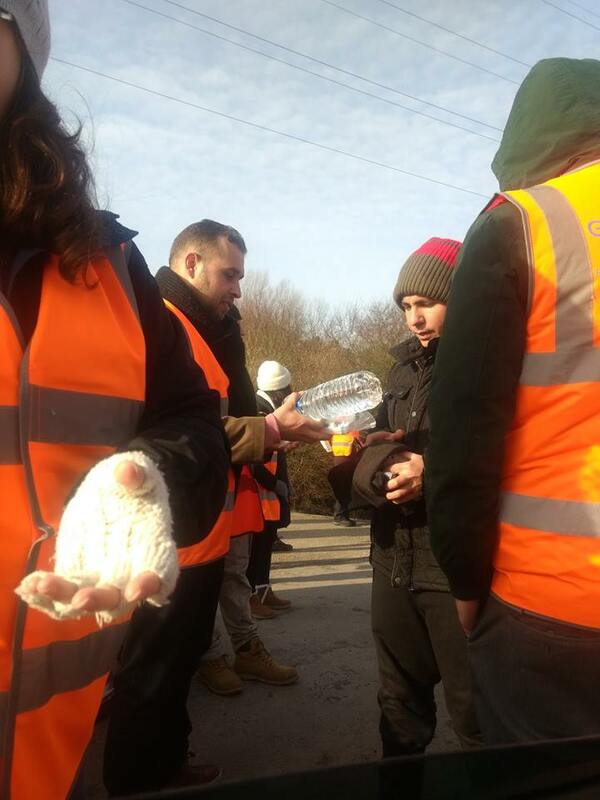 Gent4Humanity volunteers distributing water in the Dunkirk refugee camp. Photo © Gent4Humanity. First, they distribute relief items such as water and sanitary products. They are one of only a few charities who bring water. Access to running water in the camps is routinely moved or cut off. When the distribution is complete, they work on other projects. They set up a generator for charging refugees’ cell phones. They set up a first aid station. There, they routinely treat scabies and other skin conditions resulting from exposure to the elements. They also treat colds, coughs, fevers, digestion issues, cuts, scrapes, bruises, sprains, broken bones, evidence of fighting, and evidence of police brutality. Volunteers talk with refugees. They gather data on the refugees’ current needs, which informs Gent4Humanity’s requests for future donations. They also gather data on where refugees are from, where they hope to go, how long they have been in the camps, and more. Some play football with the refugees. If children are there, they play with them. They talk and listen and remind refugees that people care about them. It seems hard for them to pinpoint a single hardest thing that they see. Terrible living conditions. Health issues. “Seeing children in crisis never gets easy,” says Oliver. They also see smugglers, or foot soldiers for the smugglers. But they put their emotions aside. They treat everyone equally. They recognize that volunteers can get discouraged when they see all that they are up against, but they try to look at it differently. They stay motivated by recognizing that they helped in some way, no matter how big or small. Each trip concludes with a volunteer group dinner together before returning to Gent. This serves as a time to debrief and decompress. There, Michelle says, you can see “how special it is, and what an amazing day it has been.” “All day long everyone’s been on a common thread.” Then, they go home “absolutely exhausted, but in a good way.” They tell volunteers to expect to need some recovery time on Sunday, too. It’s exhausting work, both physically and emotionally. “I know it’s eating up the weekend, but everyone seems to get something out of it,” says Michelle. The Square.Gent first introduced you to Gent4Humanity in our post, “How To Find Volunteer Work In Gent”. Michelle and Oliver deeply appreciate their volunteers. They’ve called them their “angels.” They proudly show group photos from different trips. Gent4Humanity volunteers share a laugh with a refugee in Dunkirk. Photo © Gent4Humanity. To become a volunteer with Gent4Humanity, Michelle explains, “we don’t just show up. There’s a process to joining us.” Anyone interested must first send an email to gent4humanity15@gmail.com to request an application form. Volunteers must be over 18 years old and must be legally allowed to cross borders. If approved, they must attend a meeting where they will receive information and training prior to going on a trip. Volunteers must be proactive, able to follow instructions, and demonstrate that they understand the guidelines Gent4Humanity gives them. Gent4Humanity’s selectivity is increasing, especially as interest in the organization has risen. A maximum number of 25 volunteers can go on each trip. With a strong retention of volunteers, trips are filling up easily. This is a difficult balance for Michelle and Oliver who want both new and experienced people to join them in their work. “We’re very connected to Gent,” says Michelle. 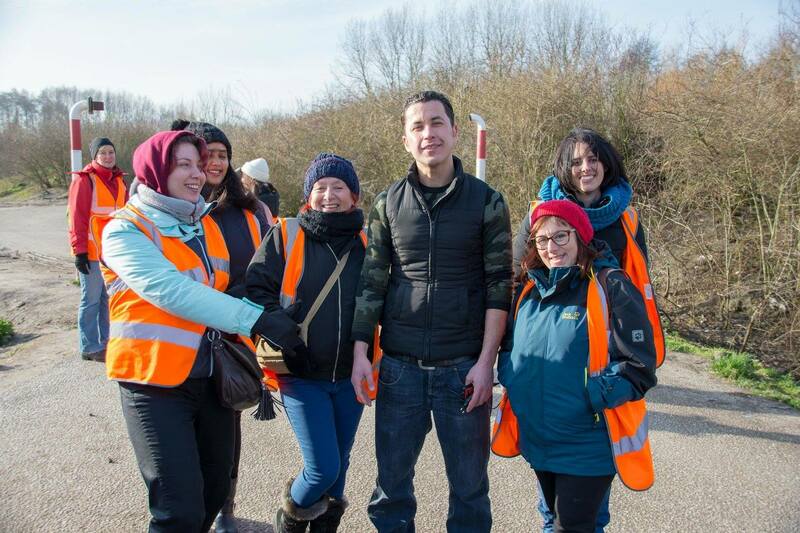 It’s even in the name, Gent4Humanity, which is proudly displayed on the back of the fluorescent vests they provide to all volunteers for identification purposes when in the refugee camps. 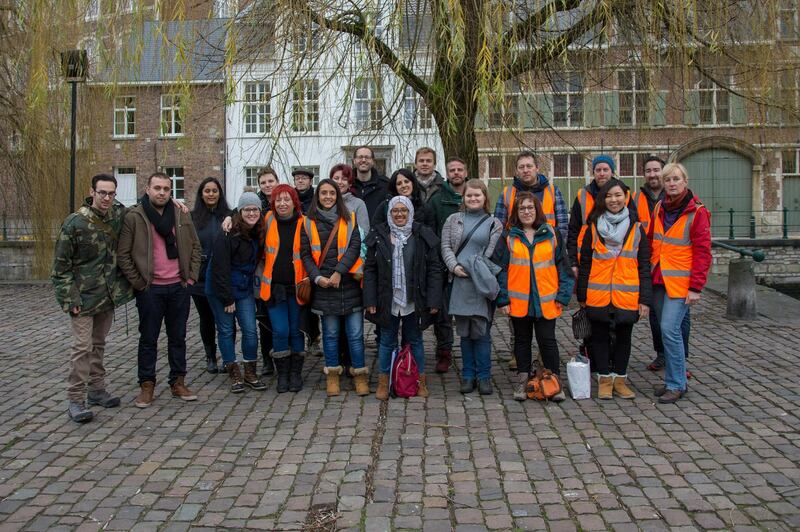 Gent4Humanity volunteers before a trip to refugee camps in France. Photo © Gent4Humanity. “I think we’re in the right city for what we do,” says Michelle. They have a sense that Gentenaars are diverse, open, and accepting. This helps Gent4Humanity succeed. The organization is currently seeking private funding to expand their programs and services in Gent. There are many ways you can help refugees and Gent4Humanity. Frontline volunteering, as discussed above, is one way. Since frontline volunteering is not for everyone, there are other ways to help. There is behind the scenes work that volunteers can assist with before each trip, such as sorting and preparing supplies for distribution. If you don’t have time to volunteer, you can donate items. Check Gent4Humanity’s Facebook page for their current “needs” list. Or, donate money directly to the organization so that they can purchase the items for the refugees. No amount of money or items is too small, because it is all combined for great impact on each trip. Beyond giving time and money, Gent4Humanity encourages people to educate themselves about the refugee crisis. Be a witness to what is happening. Be a voice for refugees. Michelle reminds us that people can say, “I did something. I was there. I was actively involved.” That is what Michelle and Oliver Wright are doing with Gent4Humanity, and Gent – and the world – is a better place for it. *Disclosure: the author is an unpaid volunteer for both The Square.Gent and Gent4Humanity.